Phillip Island sits almost due south of Melbourne in Southeastern Australia and was a natural stopover on the 10-week surfing pilgrimage my two sons Daniel (11) and Israel (13) and I were on. To get there, we had driven a 2006 VW diesel pop-top camper van through the immense coastal wilderness and ancient gum forests of Eastern Victoria or Eastern Gippsland. The only other vehicles on the hilly two-lane Princes Highway were huge logging trucks filled to the brim with giant eucalyptus. The evidence of the devastating fires-burned out hillsides, blackened stumps — that hit Victoria almost a year ago, was everywhere. Managed by Phillip Island Nature Parks, a non-profit organization established by the State of Victoria, the island is a Disneyfied version of a national park. It is home to a large colony of penguins, thousands of fur seals, white sharks, wallabies, koalas, and a Grand Prix racecourse. Just a short drive over a bridge from the mainland, Phillip Island is one of the most popular tourist destinations in Victoria. Despite that, it is still ruggedly beautiful and has a variety of great waves for surfing. Upon our arrival we headed to Cape Woolami, the most famous of the island’s surf spots. The waves that broke along the beach, which is protected by large dunes, were shoulder high and immensely rideable. The water was in the mid 50s and required us to wear neoprene booties and hoods along with our winter wetsuits. After about about 90 minutes in the cold water, we returned to the van for hot tea, ramen noodles and our hoodies. During our stay on the island we scouted for waves during a succession of never-ending storms, offshore winds, rainbows, sunshine, and a hailstorm. We were in the middle of the Southern Ocean winter with weather coming straight at us from Antarctica. The boys and I enjoyed an afternoon of 4 to 6-foot Woolami waves and then watched a squall snuff out our fun. Israel and Daniel found diversion from the rain in the A Maze’N Things theme park conveniently located next to our campground. I enjoyed a few rare hours of solitude. The highlight of Phillip Island was observing hundreds of Little Penguins (the smallest specie of penguins, about 16 inches tall) emerge from the ocean in a “Penguin Parade.” The penguins mesmerized Daniel as they emerged from the surf and waddled their way from the beach into their sand dune dens. We also enjoyed wandering among koalas and wallabies at the Koala Conservation Centre near our campground. Israel (left) and Daniel Dedina rejoice when the family reaches Bells Beach. 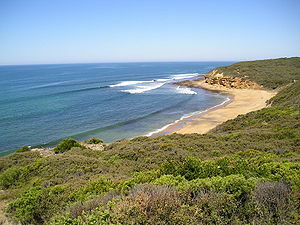 We pulled into Torquay, the home of Bells Beach, one of the world’s most renowned surf spots, with high expectations. The Santa Cruz-like city, about an hour southwest of Melbourne, is home to the Surf World Museum and corporate surfing giant Rip Curl. “Maybe we’ll see pros here, dad,” Daniel said excitedly, as we we drove the Surf Coast Highway, passing surf shop after surf shop: Globe, Rusty, Quiksilver and the large Rip Curl retail center. We hurried through town, found the turnoff to Bells from the Great Ocean Road, and drove by fields filled with kangaroos. 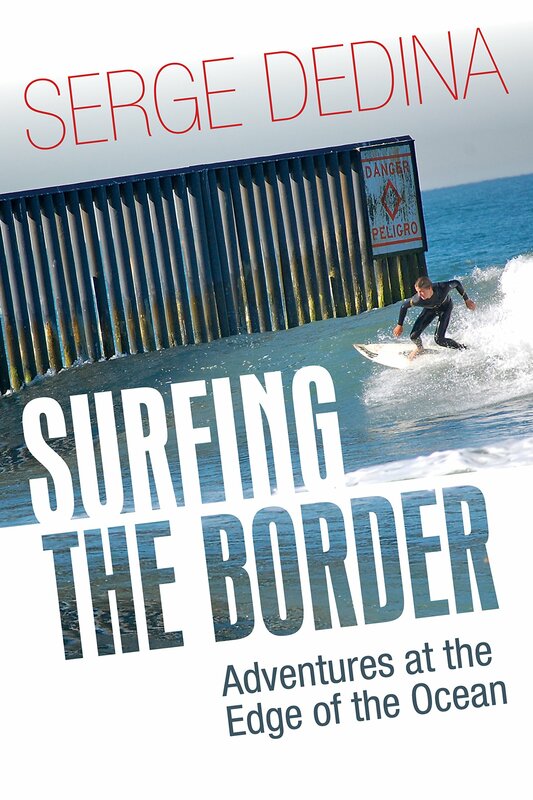 As we pulled into the parking lot of the world’s first surfing reserve, we could see that the swell was up. A vast reef and point fronted by sandstone cliffs, Bells was not breaking that well (it requires a really big swell to get good), but the adjacent Winkipop, a rocky point where waves break for hundreds of yards, looked great. Israel jumped out of the van raced to the edge of the cliffs, and shouted, “It’s going off.” We had arrived! Over the next few days, we shuttled between the 30-acre beachside Torquay Caravan Park (that charged us about $7 a night for a campsite) and the Bells parking lot. After surf sessions, I cooked up pancakes and ramen noodles in the van. The boys enjoyed meeting other visiting surf pilgrims from Tasmania, Western Australia, New South Wales and Queensland – all living in their own beat-up vans, plastered with surf stickers, in the parking lot. When we weren’t surfing, we took day trips: An outing along the Great Ocean Road provided a stunning introduction to one of the world’s most scenic coastal drives. We took an overnight trip to the Twelve Apostles, a national park featuring awe-inspiring sandstone monoliths at the edge of the Shipwreck Coast. We also enjoyed visiting the excellent Surf World Museum in Torquay. The boys loved the Bells surf contest trophy “Bell,” the huge display of retro surfboards, and the informative exhibit on the history of big-wave surfing. On one day trip, the family visited the Twelve Apostles. One afternoon while surveying the surf from the parking lot ,we realized that the swell had come up and Bells was offering solid but stormy 6- to 8-foot waves. Israel who is fearless, quickly threw on his wetsuit and rushed into the surf. I waited and paddled out with Daniel, who is more cautious. Together we managed to snag a few of the gray-black double-overhead waves, enjoying the company of a handful of friendly local surfers who were ripping. Back in the parking lot, after changing out of our wetsuits, it was apparent that the temperature had dropped even more. For the first time during the trip, the boys convinced me to get a motel room. We retreated to the reasonably priced Torquay Tropicana Motel near the Surf World Museum, owned by a Troy and Casey Dunlop a young couple completely in tune with the needs of traveling surfers. The lobby came complete with a surfboard signed by world tour surf pros including former world champ Mick Fanning (that sealed the deal with the boys). Troy, a surfer, promised a dawn patrol with offshore winds the next morning and we slept soundly. After another great surf session, we departed Bells the following afternoon and headed back north toward the warmer beaches of New South Wales. We enjoyed another month of surfing and wildlife adventures in Australia including a great week with my wife, Emily, exploring Sydney and beautiful Jervis Bay. Now, back home, we are enthusiastically planning our next family surf adventure to Australia. Originally published by the San Diego News Network. am genuinely pleassant to read everthing at alone place. What’s up friends, nice article and nice urging commented here, I am genuinely enjoying by these. i – Phone pedometer apps, all you need to do is to put this app in your pocket and start running or walking.